Through the voting game Prezident 21, we wanted to introduce Janecek Method (D21) to the public, and find such a president, on whom the largest amount of people agreed. In this game a player could use up to 3 plus votes and 1 minus vote. The voting game Prezident 21 was a pilot project of the Institute. Our aim was to familiarise the general public with functioning of Janecek Method (D21). We used the current trends; presidential elections and online voting, so people could try out the method in practice and grasp its main advantages. The project’s aim was also to increase the general interest in the presidential election start up a debate on alternative voting systems and the role of new technologies in politics. Everyone could use up to three positive votes and one negative vote. 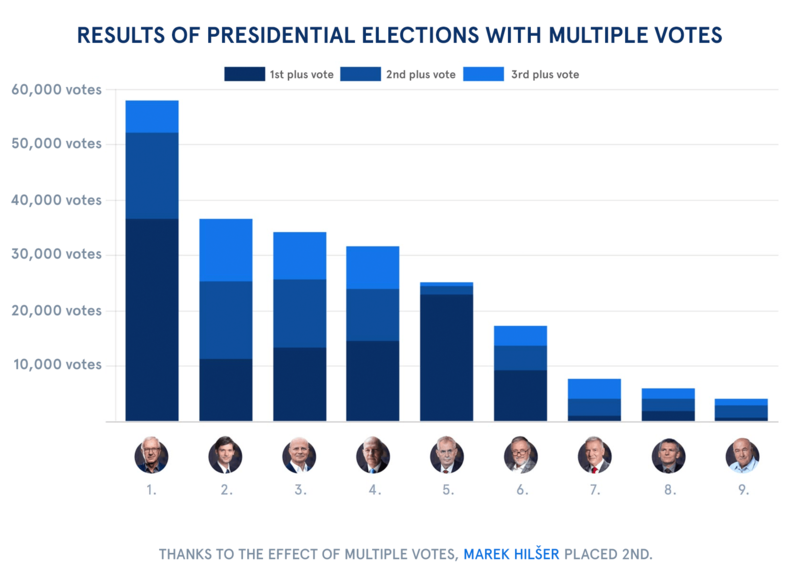 The effect of multiple votes allows that the game found the most consensual presidential candidate. During a time of visible polarisation of Czech society, electing such a person could help society's reunification. The game presents a key quality of the Janecek voting system, searching for the most acceptable winner for the maximum possible number of voters. The first phase of the game started on 21 December 2016 and run up to 24 November 2017 when users could nominate any personality fulfilling real conditions for presidential candidacy. Visitors generated a “catalog” of over 600 popular Czech personalities and politicians. This support was meant to motivate these candidates to run for the real office. In the second phase from 24 November 2017 onwards it was only possible to vote for official candidates. The web was the place to find all information regarding the presidential election; it assembled relevant reports in the media, and mainly offered detailed profiles of all official candidates. We succeeded in directly engaging all candidates in the game except for Miloš Zeman, the president. Leading up to the elections we also created so-called Voting Advisor. This feature helped users compare opinions of the candidates and assess who they agree with the most. The Advisor was filled out by a total of 227, 864 users. The second phase of the game ended with the first round of elections, on 13 January 2018, and its winner became Professor Jiří Drahoš. Thanks to the effect of multiple votes, Marek Hilšer placed second as he received many second and third votes. President Miloš Zeman, on the other hand, lost due to accumulation of too many minus votes, despite his popularity and victory in the real elections. Having a large portion of both minus and plus votes indicates candidates’ controversy. The target group of the game was made up of legal voters of the Czech Republic, therefore men and women aged 18 and over having the right to vote. To avoid manipulation of the voting, players had to verify via SMS. In order to validate our online results, we conducted a terrain research, during the election days of the first round, on a representative sample (2,500+) of the Czech Republic. The agencies MEDIAN and STEM/MARK performed the research for us. The field survey [PDF] confirmed victory of Jiří Drahoš and specified the order of other candidates in comparison with results of the online game. The game proved that the Method with multiple votes is naturally understandable for voters. Analysis of the results supports that if Czechs could use multiple votes, the elections would have ended up differently, and a greater part of the Czech population could have been satisfied with the results. 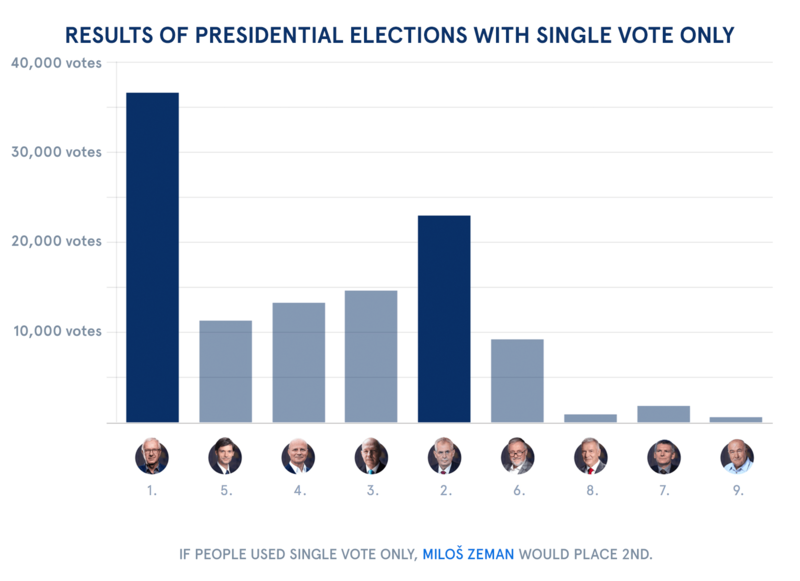 Among the main rivals of the election - Miloš Zeman and Jiří Drahoš - a major overlap of voters existed: a total of 33 % of those voting for Miloš Zeman gave one of their other votes to Jiří Drahoš, and conversely it was 5 % less.